The ProJo recently covered the story of retailers feeling cut off by the reconfiguration of Route 195. On the old alignment of Route 195, Exit 2 went to Wickenden Street and the big green sign on the overpass said as much. Now, the eastbound exit which one would use to reach Wickenden is simply signed for India Point and Gano Street, much to the chagrin of business owners on Wickenden. I hate that this is such an autocentric problem, but I’m sure it is true. When there is no Wickenden Street exit, people can’t find the street. RIDOT is responding to the concerns of the business owners and plans to experiment with some signage for Wickenden Street. RIDOT will look into placing smaller signs on Route 195 alerting motorists to use the Gano Street exit to reach Wickenden. And on Route 195 Westbound, the new South Main Street exit will have Wickenden Street listed on the big green signs on Route 195. 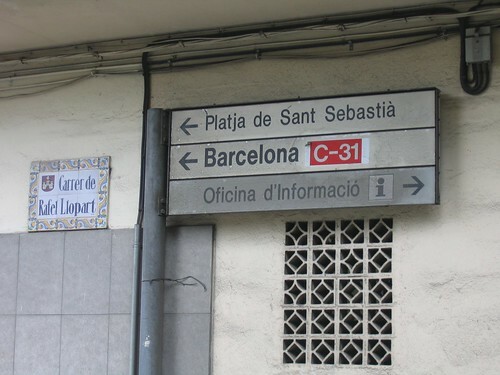 This is indicative though of the city falling short when it comes to wayfinding. RIDOT can put all the signs they want on Route 195, but there needs to be better signage on city streets. The sign above on Route 195 westbound is before the Washington Bridge. 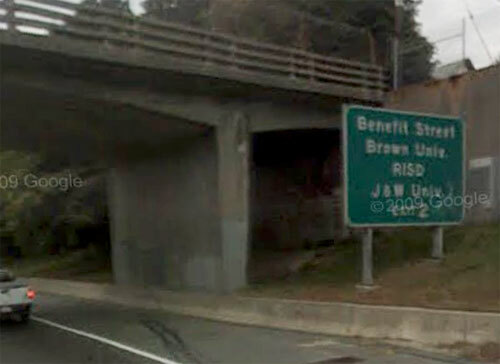 It tells drivers to use Exit 2 to reach Benefit Street, Brown, RISD, and Johnson & Wales. That exit leads you onto South Main Street so you will eventually arrive in the middle of RISD’s South Main campus area, but I challenge you to pretend you don’t know, and rely on signage to try to reach Benefit Street, Brown, and J&W from Exit 2. To make our city truly visitor friendly and to help customers reach business districts, Providence really needs to invest in a comprehensive wayfinding system. I am one of those people that never goes anywhere without a map (espcially now that I have a smartphone) and thinks too much signage can be distracting and somewhat ugly. I have seen way finders like the one above from Spain get bigger and bigger as additonal interests keep getting added on. Seems that you need a sign at the bottom of the Gano st exit on 195 West indicating a right turn on Gano to get to Wickenden st and then a sign indicating a left at Wickenden where it T’s at Gano. The new and improved exit 2 on 195 West will dump you at Wickenden so maybe just a business district sign might do. Make it and the one at the Gano\Wickenden st end identical to each other. Branding the district (like the old mural did) may help. For 195 East, the new exit 2 that drops you off at India Point already has signage at the bottom of the ramp. A pointer to Wickenden St could easily be added. I believe the traffic pattern is going to put you back at Wickenden and exit 2 West where where the business district sign will be visible. If you did go the wrong way you end up at Gano where the signage from 195 west should be able to reorient you back in the right direction. Hopefully when all the contstuction is done the City will take a look at the new traffic patterns and look at ways to make it easier to get around. When exits keep appearing, disappearing and moving its tough to put up anything more than temporary signage. Businesses can go along way to help themselves by making directions more interactive on their websites. I still find web sites that insist on static text based directions that don’t keep up with traffic changes. With the advent of smartphones, gps receivers and location based social networking, businesses can make it so much easier to have customers find them.